The gutters that once served you so well are now beginning to sag and leak. They no longer transport excess roof runoff when it rains. Years of exposure to Hamilton, OH weather can take its toll on gutter systems. When it's time to replace them, you want to ensure the job is done correctly. Whether you decide to do it yourself or hire a professional, what matters is that the installation is done correctly. If you have the knowledge, skills and physical ability to install your own rain gutters, you could save the cost of an installer. This is one of the greatest benefits of do it yourself methods. It works best when you've had the experience to deal with any installation issues that could arise during the process, or a friend or family member who does can assist you. Before you begin the diy task, decide on the material types that you will use, either metal or vinyl, then get a professional gutter installation estimate first. Next, compare it with a gutter installation cost per linear foot for diy, and make certain that you acquire reliable gutter installation instructions prior to starting. This will give you an idea of how closely your skills and knowledge match the requirements for self installation. If you have no gutter installation experience, the task may become more than what you bargained for. Mistakes in the installation process could become costly if materials are damaged. Incorrect installation can result in a gutter system that is not capable of functioning to its highest potential. 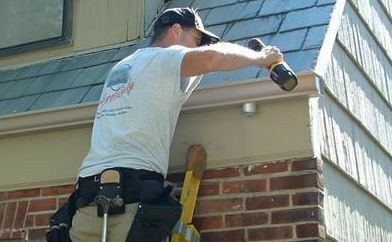 Consulting with professional gutter installers takes all of the guesswork and labor out of the job. Often, the main reason that people opt for diy installation is because they want to save as much money as possible. In the long run, having a professional do the job can save in gutter installation cost. When it is done right the first time, there is no need to repeat the process and waste costly materials. We are Hamilton Gutter Pros and are available to serve clients in the Hamilton, Ohio area. We specialize in the installation, cleaning and repair of rain gutters. If you're undecided about whether to do it yourself or call in our team, we can discuss your situation and provide you with information that can be helpful in choosing which option would be the most advantageous for you. We are happy to deal with customers one on one and give estimates on the supplies needed and cost of materials for the do it yourself enthusiasts. If you decide that gutter installation is really not your best option, we'll provide you with gutter installation estimates that include the totals for labor and materials, with an additional estimate on the amount of time it will take to complete the installation process. Give us a call or stop by to see how we can help.